Experience art is all the rage these days. Create an installation that requires a queue and it seems that you will instantly have visitors flocking to stand in it. Shows at the Hayward over the last few years by Antony Gormley and Martin Creed, or themed around the artist’s mind or the use of light, have shown just that. But what about participatory art that cannot exist without the willing dedication of time by hundreds of volunteers? In 2009 I was lucky enough to be one of 2400 participants involved in Antony Gormley’s Fourth Plinth piece One and Other, where each person had one hour to do whatever they liked on the space of the plinth. It was an extraordinary experience and an artwork that really captured public imagination. With that experience behind me, therefore, I jumped at the chance to volunteer for Historic Royal Palaces’ poppies installation as part of ‘Tower of London Remembers’ for the First World War centenary. Ceramic artist Paul Cummins has conceived an extraordinary artwork that takes over the moat of the Tower in order to remember the 888,246 British military lives lost in the war (although it’s sad, and indicative that this number doesn’t include a large number of commonwealth soldiers from outside the crown colonies). With the evocative title Blood Swept Lands and Seas of Red the poppies spill out of a window of the tower and rise in a wave over the main visitor entrance bridge, slowly to fill the moat in an undulating flood. From a distance the effect is mesmerising. 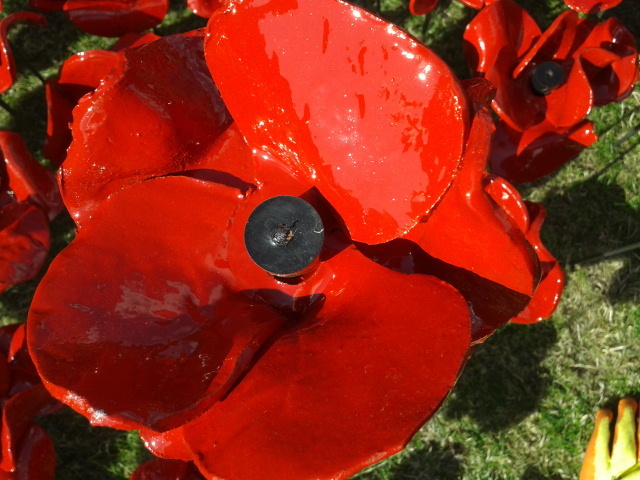 As a volunteer your time is repaid by the wonderful opportunity to interact with the installation, and each ceramic poppy is as appealing up close: powerfully red, painfully fragile, personal and unique. An introductory film explains how each flower has been hand-made by a team of makers, building the layers of petals together, and I was struck by how the installation manager stressed the material nature of each flower, their weight, and haptic appeal; how the act of planting should be reflexive. 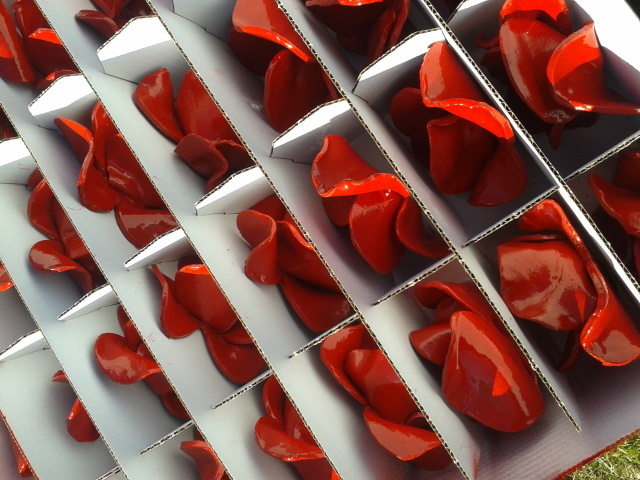 Each poppy relates to a life, and the project involves the touching act of returning all broken or misshapen poppies to the Derby workshop to be buried in a memorial site. The process brings out the best cooperation and team work in a group of strangers. 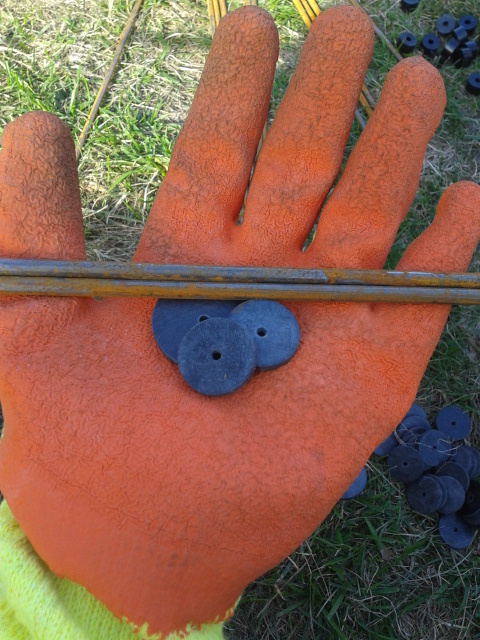 You put together the metal stalks with supporting washers, ‘plant’ them in the soil of the moat, and then carefully attach the ceramic poppy to the top. 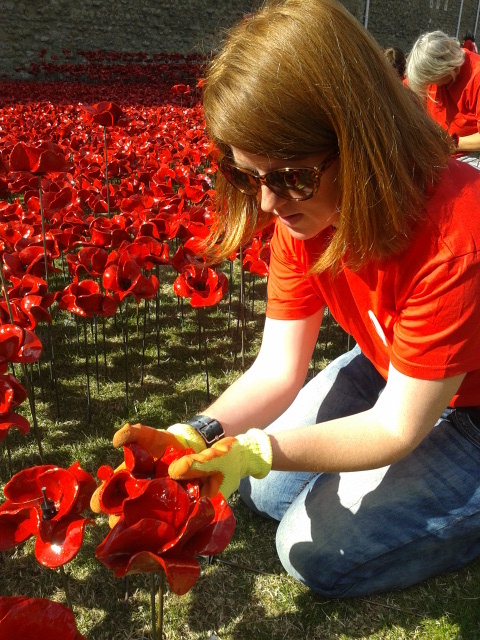 Volunteers are given complete freedom to extend the advancing wave of poppies in what curves and tendrils they wish. The physical exertion involved is both satisfying and reflective, as well as providing an added attraction for the Tower’s many tourists. I walked out of the Tower on a sunny Bank Holiday Saturday feeling strangely at peace. The strength and wonder of this installation is that it’s highly personal. 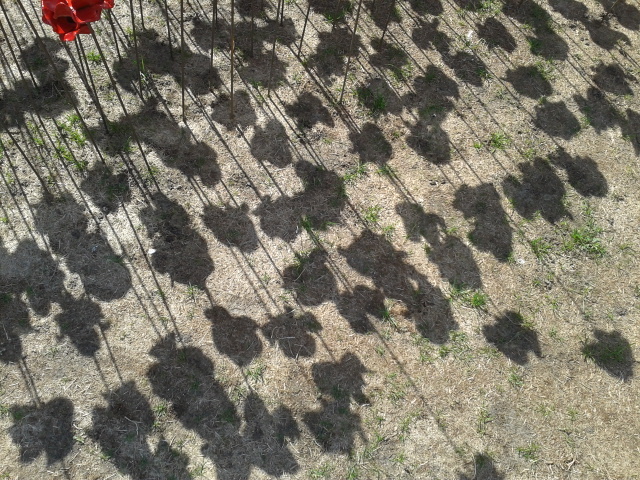 Every single fragile flower symbolises one life lost in the war. The process of building and planting these flowers brings home in a striking, material way the shocking loss of life. 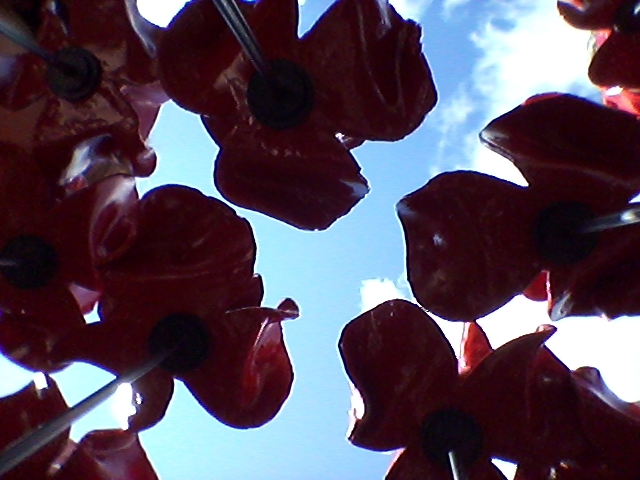 Volunteering gives you the enviable opportunity to explore the installation in the moat as it grows; to photograph the poppies endlessly from above, below, left and right, to lie among them, hover over them and peer close up at each tiny difference. The more you look, the more overwhelming the numbers of poppies, their uniqueness and fragility are. I cannot claim to have had any more than a uniquely personal experience of this artwork, as distinctive as every poppy: but that, I think, is part of the point. I have, therefore, written this very personal response in the hope that Apollo readers will also visit, respond, remember, and maybe volunteer. It’s an experience worth queuing for. 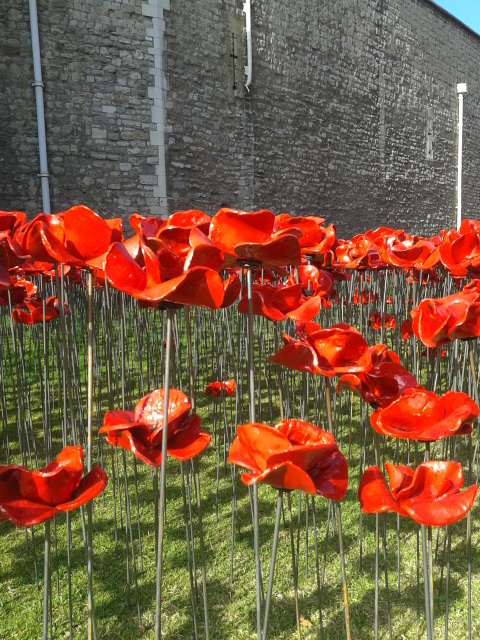 Blood Swept Lands and Seas of Red is at the Tower of London until 11 November. Learn more about volunteering at the project here.